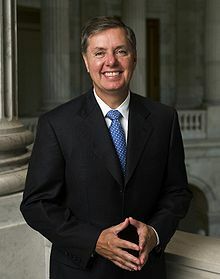 Lindsey Olin Graham (born July 9, 1955) is an American politician who serves as the senior United States Senator from South Carolina, serving in office since 2003. He is a member of the Republican Party. Graham was born on July 9, 1955 in Central, South Carolina. his parents were Millie and Florence James "F.J." Graham. He studied at the University of South Carolina. In 2002, Graham ran for the U.S. Senate after eight-term Republican incumbent Strom Thurmond announced his retirement. Graham won the primary unopposed and defeated Democratic opponent Alex Sanders in the general election. Graham was re-elected to a second term in 2008, defeating Bob Conley. He won a third term in 2014, defeating Democrat Brad Hutto and Independent Thomas Ravenel. Graham is known in the Senate for his support for a strong national defense, his support of the military, and as an advocate of strong United States leadership in world affairs. He is also known for his willingness to be bipartisan and work with Democrats on issues like global warming, tax reform and immigration reform and his belief that judicial nominees should not be opposed solely on their philosophical positions. He is also a critic of the Tea Party movement. During his political career, Graham never lost an election. On May 18, 2015, Graham informally announced his candidacy for President of the United States; he made a formal announcement on June 1 in his hometown of Central, South Carolina. After low polling numbers, Graham withdrew from the race on December 21, 2015. He later announced his support for Jeb Bush for president. Graham has never been married and has no children. He was close friends with the late Arizona senator John McCain. ↑ "Lindsey Graham, a Twang of Moderation". The Washington Post. October 7, 1998. ↑ Juanna Summers, "5 Things You Should Know About Lindsey Graham," NPR-All Politics, May 31, 2015. ↑ Jonathan Martin (May 9, 2013). "Lindsey Graham faces down primary challenge". Politico. Retrieved October 8, 2014. ↑ James Podgers (August 5, 2012). "Sen. Lindsey Graham: Qualifications of Judicial Nominees Should Count More Than Politics". ABA Journal. Retrieved October 8, 2014. ↑ Harold Maass (May 9, 2013). "Is Lindsey Graham going to get primaried?". The Week. Retrieved October 8, 2014. ↑ Linda Killian (June 10, 2014). "Lindsey Graham vs. the Tea Party". The Wall Street Journal. Retrieved October 11, 2014. ↑ Patrik Jonsson (June 11, 2014). "The un-Cantor: Sen. Lindsey Graham wins by poking eye of tea party (+video)". The Christian Science Monitor. Retrieved October 11, 2014. ↑ Alex Altman (November 5, 2013). "Lindsey Graham: The Bipartisan Dealmaker Finds Issues to Please GOP Base". Time magazine. Retrieved October 11, 2014. ↑ Rappeport, Alan (1 June 2015). "Lindsey Graham Announces Presidential Bid". The New York Times. The New York Times. Retrieved 1 June 2015. ↑ "Republican Lindsey Graham quits 2016 race". BBC News.com. Retrieved December 21, 2015. This page was last changed on 21 March 2019, at 06:03.